Arthur, supposedly the initiating force behind the movie, often appears to be the biggest subject of the filmmakers’ manipulation. Or is he helping to pull the strings alongside Mike and Nathan? In this sit-down with Way Too Indie, Actor Martinez stars Lindsay Burdge and Arthur Martinez discuss the complex concept behind their new film, the freedom of working without rehearsal and the livewire aspect to its production. 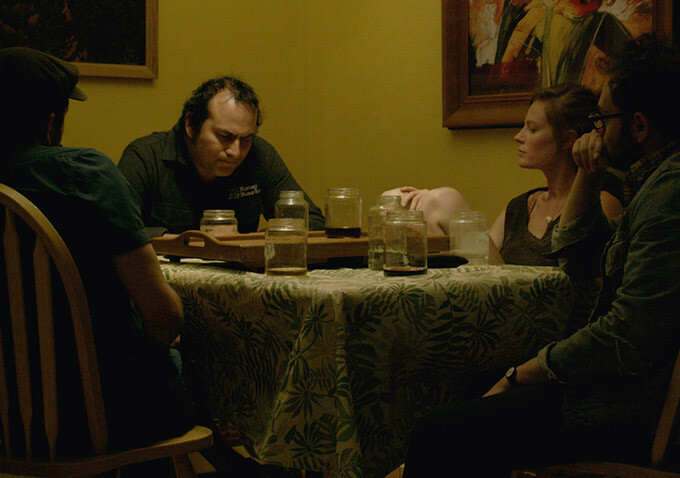 Actor Martinez recently held its US premiere at the Tribeca Film Festival. It is currently seeking distribution. How did this project first come to you both? Arthur: I was actually, inadvertently, one of the pitchers. I didn’t know what I was pitching for. I knew I was throwing, but I didn’t expect this weird curveball. Lindsay: Nathan [Silver] and I had hung out at another film festival shortly before he pitched this to me. Then, we were in New York and he said, “We came up with this movie in Denver, we want to make it soon. Do you want to do it?” He said it was about a man, Arthur, and this woman falling in love. I was supposed to be a gardener or something like that and it was supposed to be a regular movie. Next thing I knew months had passed and I was sent this outline which was not that movie at all. Arthur: Wow, you got an outline though. Lindsay: You knew that [Laughs]. Arthur: That still blows my mind [Laughs]. Arthur: I still haven’t seen the outline. That’s why I’m amazed at what she’s saying. She’s told me this before and I still have a hard time believing it. Once you actually got into the production phase, were you anticipating the extent to which this would blend between documentary and narrative? Were you caught off guard when you were actually filming? Arthur: That whole film is me caught off guard. Yeah, no, they didn’t tell me anything. They went to extra pains to hide what was happening. They would hide me off set somewhere and have somebody guard me so I wouldn’t go look beforehand. What’s it like going into that situation where you don’t have that safety harness—or a script—to guide you? Arthur: My classical training got in the way. I had to throw it out. You just have to throw it out. So after the first three days, I figured just throw it out. Lindsay: There was definitely an adjustment period. I definitely knew more than Arthur did, about how it was going to be this blended thing, but there were a couple layers that I didn’t know were going to be there. I knew I was going to be playing myself. I knew I was going to be playing this character, but then there were these other characters also that I didn’t know I was going to have to sort out. So the first day was very stressful and the second day got a little less stressful and then it became fun once I understood the rules, but until I knew the rules of the game we were playing it was very stressful and uncomfortable. We didn’t have anything really to hold onto at first. There’s no script, there’s no character, and so we weren’t working on a scene together. It was more like manipulating each other [Laughs]. Arthur: She’s right. They used us as weapons against each other and I’m sorry about some of those things I had to say [Laughs]. It sounds a lot like theater exercises, almost more so than the traditional narrative structure of film. Did you find it liberating at all? Lindsay: Yes, I thought it was really fun. It became really fun for me. Arthur: Yeah, it was always scary, but I’m down. Lindsay: Sometimes you had fun, right? Arthur: Well… yeah. I mean, there’s a reason I did this. It’s like riding a roller coaster, I’ve been screaming the whole time. It’s awesome. Arthur: I don’t remember actually making that rule, I think that was [co-directors] Mike [Ott] and Nathan [Silver]. Arthur: Nah, you can’t mess with the director. Not on set. It must take a lot of faith then to just throw yourself into that process and trust it. Arthur: You trust the talent that you’re working for. It was a lot of pressure to make sure if they spent five hours setting up a shot that I actually did my job. Which is difficult when you don’t know what your job is, but that’s ok. You just do it. Hope for the best. Lindsay: It was mostly just being. At least from watching you, it seemed like just being kind of open and available and reacting, which was cool to watch actually. There’s a lot of tension though in some of those interactions. How much of that was authentic? Arthur: You just defined acting. Serious, that’s the definition of acting and if it’s not, you’re not doing your job. Lindsay: I think some of it was definitely real and some of it was manipulated. And I’m not sure Arthur still knows which is which [Laughs]. Arthur: I don’t know. I’m just going with it. Lindsay: And I don’t either sometimes. Some of those times, I think we were recreating that tension or the tension was to swerve the plot of the movie, which there is actually a plot. Other times it was real frustration. It was fun kind of fun for me. Sometimes I felt like your advocate. Arthur: Thank you, I did need that. It was brutal. They just beat up on me until she showed up. They’d got me so far off what I realized center was and she did a great deal to re-center me. It gave you a partner in the process. How much of what’s on the screen do you actually feel responsible for injecting into the narrative? Arthur: This is like taking bunch of colors—everybody who worked on this—and swirling them all together. How much of that is me? I can’t even tell anymore, maybe none of it. Maybe some of it. I don’t know. Lindsay: Did you even suggest shooting in your apartment? Arthur: That was a resource, yes. That was the purpose of it. I didn’t know we were going to shoot what we shot. Lindsay: I still don’t know what he’s… I don’t trust this guy. Arthur: I don’t trust me either. It’s crazy. Lindsay: I don’t how much of it is you… because I arrived and it was already underway. Arthur: You’re right about that. I was part of the early production process, I just didn’t know what was coming out of it. I just made the decision to trust Mike and Nathan. Those guys are crazy. Now that you’ve had the chance to see the final film, how closely did it resemble what you thought you were making? Lindsay: Very closely for me. Arthur: Ok, I’m down with that. It must have matched the outline at least. Lindsay: It didn’t match the outline. The outline was four pages long and had almost nothing in it, but it matched what I felt like we were making while we were making it. Are there any things from this experience, the looseness of it, that you maybe miss in other films that you make? Arthur: I think they all should be different. They’re all very different experiences and that’s ok. I liked that. I like how fresh it was, and it would be interesting to think about how to bring that to other stuff. We had to be so quick on our feet. But I don’t know how you could bring that to something when you’ve read the whole script and you know exactly what you’re saying. Is it wrong to think about this film as percentages? As 50% documentary, 50% fiction? Lindsay: You’d probably be wrong if you tried to divide it. Even if we tried to divide it. I still don’t know how much Arthur knew what was going on all the time. Arthur: She’s right, I was part of the initial production, but it was definitely different [by the end]. There’s no way to identify what’s real or not in the scene. I can say this part of the scene is real. I’m sure it would be like reading a story about yourself in a tabloid. In many ways, this is a tabloid film.